Although another mild winter storm has arrived this week, I have spring fever from the few days of short-sleeve weather that we have had in Santa Fe recently. This weather leaves me wishing that the warmer spring days will stick around, days that beckon me to go out and enjoy the weather. I long to be in my garden visually scouring the surface of the soil for any sign of a newly germinated vegetable. Now, here I am looking around the store for something to share with our blog reading audience and I see Anne Schwalbe’s newest book Wiese, which for now will have to quench my desire for new life and greenery. Printed in an edition of 500 signed and numbered copies, this book object is presented as Schwalbe’s earlier publication Blindschleiche und Riesenblatt. It unwraps, following my obsession with spring and gardening, as a seed packet: one brown bag opens to reveal a Wiese image postcard held tightly to the outer heavy stock envelope by two rubber bands and inside Schwalbe has included another brown bag housing the unbound folios -- the pages scored and tucked one inside the next. Once open, each page lays flat so that each image may be enjoyed without the burden of the gutter. In the description that Schwalbe supplied with the book, she only states “it’s about meadows” and it is just that, about meadows. 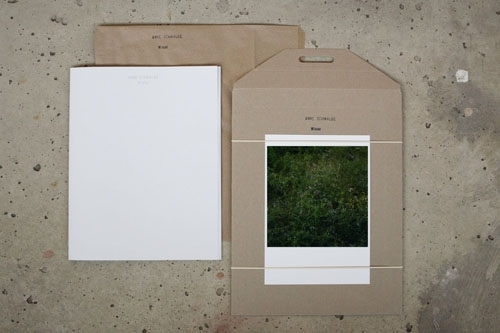 Each image in this simple, but elegant book represents one small detail of the lushly colored and blooming landscape. Most images are filled with forest green and touches of yellow, pink, white and purple from the flowering plants that dot the frame. The colors are deep and rich, captured in the waning light of the day and the subtly speckled offset white paper absorbs the images, while the inks rest perfectly on the page and leaves each image sharp and crisp.